A brand is a promise to stakeholders. A promise that you can somehow better their world and provide a feeling they can’t get anywhere else. But before you can promise anything great, you must be clear on exactly what you do, how you do it differently to everyone else, and why you do it in the first place. We help you uncover, challenge and define your truths, beliefs and purpose. We give you a filter to make choices and a platform to deliver experiences that strengthen your brand and position your business for long-term growth. A brand is a promise to stakeholders. A promise that can somehow better their world and provide a feeling they can’t get anywhere else. But before you can promise anything great, you must be clear on exactly what you do, how you do it differently to everyone else, and why you do it in the first place. We help you uncover, challenge and define your truths, beliefs and purpose. We give you a filter to make choices and a platform to deliver experiences that strengthen your brand and position your business for long-term growth. The digital experience is not just a platform or an isolated strategy. It permeates every part of your brand expression. Interactions between people and your brand take place on your digital platforms every day. If the experiences disappoint, people rarely return. Based on user insights, market research and a deep understanding of your business and ambitions, we help you create digital experiences that bring your brand to life, that engage and impress the first time and every time. Digital strategy, content strategy, user experience, technical platform insights, website design, app design, intranets, digital brand guidelines, copywriting, video content, animation, front-end development, analytics reports. To stand out in a noisy market requires a clear visual strategy. A design that is rooted in your brand strategy and reflects and supports your brand promise. With an equal amount of brains, hearts and guts, we blend business, creativity, ideas and action to help you go against the norm and beyond your form, to create and launch meaningful, compelling and distinct brand identities, systems and experiences. Implementation and delivery of your brand experiences is as critical as the brand creation itself. It’s in the meet with your stakeholders - internal and external - that the brand is shaped. Through a focused process, with technical expertise and in close collaboration, we guide you through the implementation. We help you with priorities, possibilities, layouts and budgets. We make sure your brand promise is perfectly clear on all collateral from stationery and brochures to signage, digital and everything in between. Memorable and successful brands are built on solid groundwork, analysis and preparation. In order to identify opportunities, we conduct desk and field research and analyse findings. We discover the audience needs and values that your brand can address to create value, differentiation and competitive advantage, whether the result is a brand strategy, design revitalization or digital experience. Make® is a brand consultancy specialized in brand strategies, design and digital experiences. With offices in Copenhagen and Aarhus, we represent a blend of nationalities and are all driven by one common driver: To deliver meaningful transformations making your business understandable and real. Our hybrid team approach integrates the best of business and design thinking turning complexity into clarity. Our focus is operationalizing insight-driven thinking providing your company with a purpose creating a filter to make the right choices. Create moments. Captivate your audience. Inspire them. Change the works and your business. Change starts when you choose to transform. Operating in a fast changing market and with a new business strategy in place, we helped FLSmidth sharpening a new position. Based on market research, customer insights, interviews and workshops, we united the global brand under one purpose, story and design. Initiated by a new business strategy, MTHøjgaard embarked on a journey to challenge industry conventions. Through market research and insights, we helped the company define a differentiating position. Based on the concept horizons, we created a new language and visual universe to communicate their mindset and processes. Hope is a powerful resource but will not prevent the potential damage of lightning strikes. That was the message we uncovered together with lightning protection experts GLPS. We created an empowering promise, a persuasive story and a new visual identity supporting their new journey. 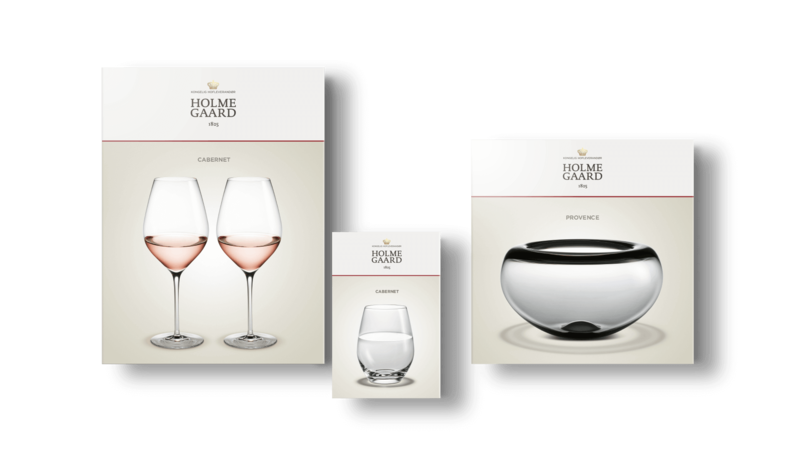 Since its establishment in 1825, Danish glassware producer Holmegaard has been setting design standards. However, to aid the ageing brand perception, a new visual position had to be created. We helped Holmegaard redefine its brand platform, and re-designed the identity and packaging, celebrating the legacy without letting the past define the brand. With an organisational restructuring, German process engineering company GEA needed to consolidate their digital presence. We helped the company with a digital strategy gathering 200+ sites into one digital framework. We focused the business offerings and created clear call to actions, increased leads and brand awareness and developed “Technology Talks” – an elaborated thought leadership section. Bringing storytelling and an eCommerce-ready platform to microphone producer DPA. Based on sharpening their brand promise ‘Get closer’ we created a strong design reflecting their superior quality of their products. A campaign site helping Nilfisk to introduce their digital programme Horizon as well as an event experience to support it. Brand-revitalisation for the world’s leading component supplier to the wind turbine industry, LM Wind Power, introducing a new identity taking outset in their blade technology. Together with Becksöndergaard, we defined their brand stance and designed an identity system built on the founding philosophy of going against the stream. We unified the guiding principles of entrepreneurship, imagination, curiosity, love and playful wit in ‘Rebellious Love‘ and created a new visual identity to match. Brands are built by people who love to challenge their comfort zone and raise their voice in multi-disciplinary teams where insights power everything. Transformations and challenges come in many shapes. If you recognize any of these, let’s talk! Since we know that not everything that counts can be counted, we treasure the awards and nominations we have received together with our clients. And we are extremely proud to be part of REBRAND Hall of Fame 2015. We work for a broad range of partners. From large scale companies to the upstart around the corner, the list represents a selection of our brilliant partners, past and present. Success in a changing world requires a insight driven creative approach to you business. We are in for the long run, but it all starts with a conversation.